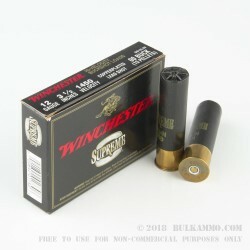 This bulk package of 00 buckshot from Winchester is an excellent way to stock up on a highly effective deer hunting shotshell. 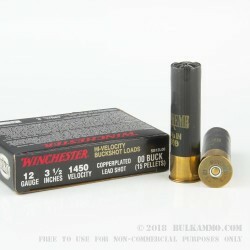 The Winchester Double-X 12-gauge shotgun shell features 15 pellets of 00 buckshot loaded into a 3-1/2” shotgun shell with Grex buffering and is capable of a muzzle velocity of 1450 FPS. The lead shot is copper plated and delivers devastating performance while the high velocity makes for tight patterns at longer distances. 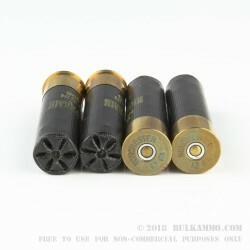 It should be noted however that due to the larger payload, these 00 buckshot rounds are not well-suited for home defense due to over penetration and more recoil than a standard buckshot. 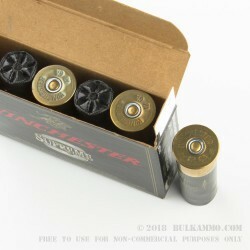 This American-made shotgun shell comes five rounds to a box and there are 50 boxes in this 250-round package. Made by an American legend, Winchester for more than 150 years has been a top producer of weapons and ammunition. Creating some of the most iconic firearms ever made, Winchester has forged a legendary reputation for quality and reliability.